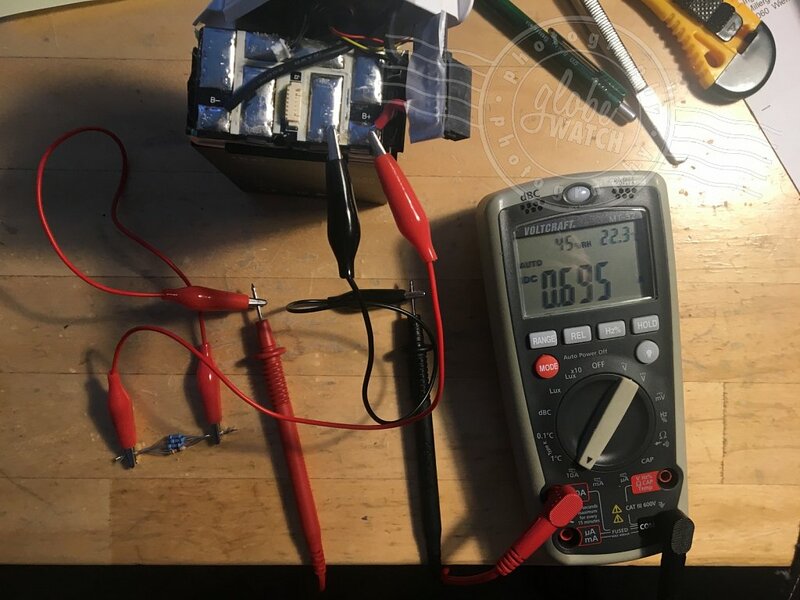 It was clear to me that the “Battery Cell Broken” error was just due to the cell voltage variation being too big and for some reason the balancing function of the “intelligent” battery firmware was not able correct it while charging. My next idea was that before I start to solder out cells I could give it a try and balance the cells manually. It turned out that for the time being this manual balance did the trick. After manually balancing both batteries I was able to charge them to a 100% without getting the “Cell Broken” error. I took my batteries into my Inspire-1 and did a test flight without any problems and I was also able to fully recharge them to 100% without the cell error reappearing. This might be only a temporary fix but for now it seems to have saved me some money by not having to buy now batteries. LiPo batteries can explode, cause fire or injury if they are treated in a wrong way. I do not encourage anyone to try the following method of manually balance LiPo cells. If you do so it’s on your own risk! The first step is to remove the plastic housing of the TB47 – search Youtube for instruction videos on how to open the battery. Now carefully unplug the balancing cable and remove the protective paper. From now on you have to be very careful not to shorten any cell contacts. In order to clip cables onto the contacts I also removed the outer plastic housing. The next step is to identify the individual six cells and measure each voltage level in order to identify those cells with the highest voltage variation. 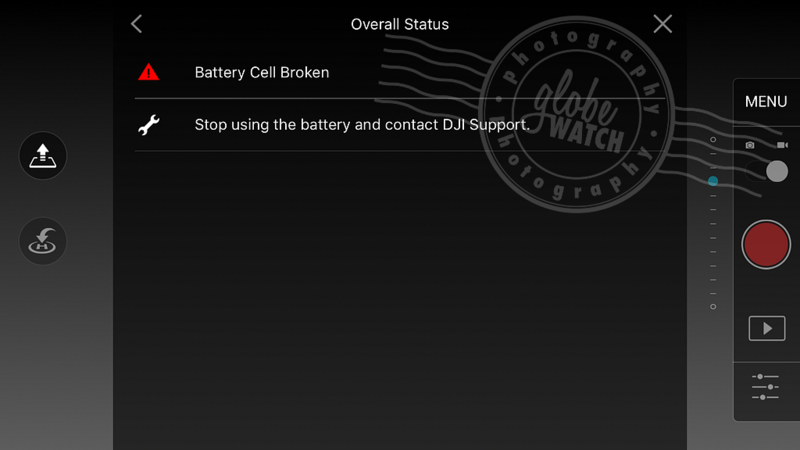 Corresponding to the cell voltage display at the DJI app, it shows that cell one (connector 1 > 2) and cell four (connector 4 > 5) voltage levels being considerably off. There are two possible ways to balance voltage levels of all cells – discharge those cells that have higher voltage levels or charge cells with lower voltages. As charging LiPo cells should not be done by just connecting any power source to the cell, I decided to go for option one and discharge those cells with higher voltages. I wanted to stay below one Ampere and simply added eight 47 Ω resistors in parallel (5,87 Ω). As I = U / R (current is equal to voltage divided by resistance) ˜4 V / 5,87 Ω equals to 0,69 Amperes. Each of my eight resistors has to deal with a current of 86 mA and should therefore support 0.5 W (P = 0,086 A * 4,0 V = 0,35 W). In order to keep track of the current I included my meter and discharged all four cells until their voltage levels were close to cell one and four (3,95 V). With this setup I takes about 45 minutes to lower cell voltage by 0,1 V – I checked the voltage level every 30 minutes but it really took about one and a half hour to have one cell down at 3,95 V.
Carefully put the battery back into its housing and charge the battery using the stock charger. Stay next to the battery while charging in case you damaged the battery while it was out of the housing! As most of you are aware, the Adobe Lightroom Catalog is not meant to be shared between multiple computers or being located on a network drive. For many photographers this behavior is very unpractical and unwanted as it is common to use laptops while abroad or on photo shoots and desktop computers once back home. You can of course import and export catalogs but I like to have the same catalog with all my photos on my laptop and on my desktop computer. The following article describes how I set up and synchronize my Lightroom catalog across multiple computers and what caveats to be aware of. My setup consists of one Apple iMac and one Apple MacBook Pro. As a NAS I use the Synology Diskstation DS713+. The LAN infrastructure is based on Gigabit Ethernet and 802.11ac Access Points. I have not tried if this solution also works in a Windows environment (eg. use Shortcuts instead of Symbolic links) or with cloud services such as Dropbox in theory it should though. The following picture shows my current setup of these two computers sharing one Lightroom catalog but it can easily be expanded to more than just two computers. All photos are located on a network drive provided by my Synology NAS. While the desktop computer can always access my photos on my NAS the laptop is often being used abroad without access to my photos. This problem off missing original photos is solved by generating Smart Previews on my laptop computer for all my photos. I do not use Smart Previews on my desktop computer. 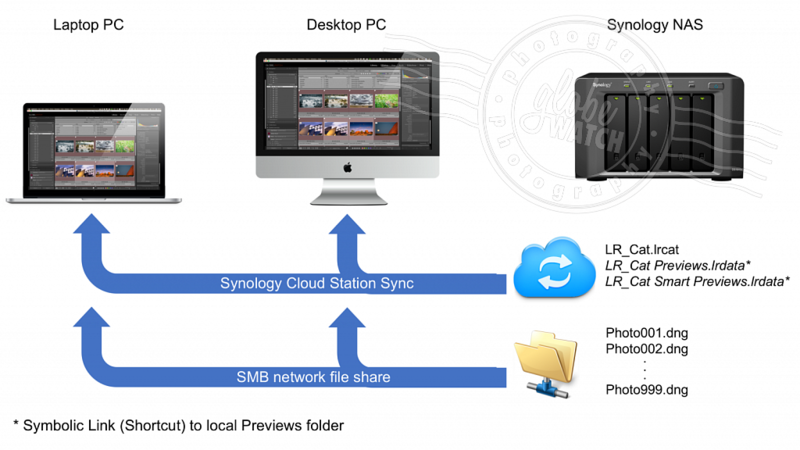 The general idea is to place the Lightroom catalog file on a local directory that is being controlled/monitored by a cloud service such a Dropbox or as in my case the Synology Cloud Station Service. 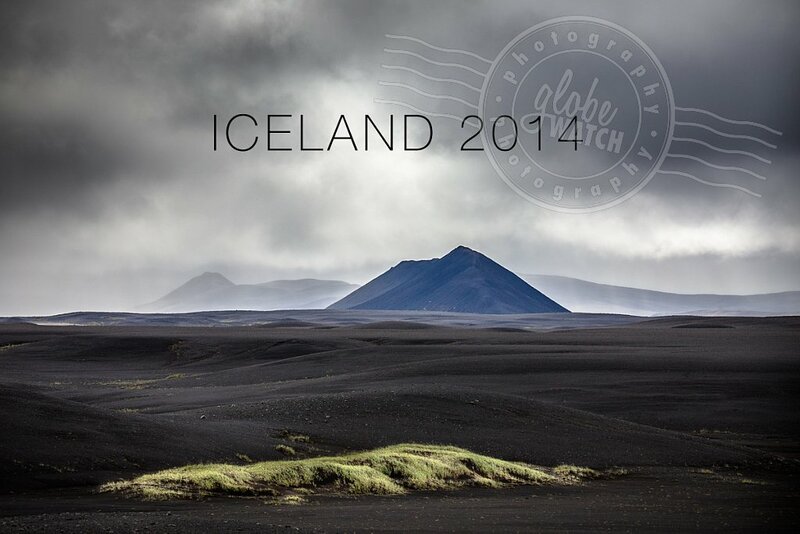 Lightroom allows to specify the location of the catalog file as long as it is somewhere on a local hard disk drive. I do run my own Cloud Sync Service on a Synology NAS as I don't want private and sensitive data to be replicated to servers that can be accessed by third parties. An equally important reason for using the Synonolgy Cloud Sync Service is the synchronization speed due to its location on my LAN. The Lightroom Catalog can easily be multiple gigabytes in size and will be synchronized every time it changes, eg. when I close Lightroom either on the laptop or desktop computer. In Lightroom it is not possible to specify the storage location of rendered previews and will always be collocated with the catalog file. Depending on your preferences, all rendered previews combined will be very big in size - in my case way over 30 GB and I do not want to synch them every time some preview information is added or changed. As the Lightroom catalog is located in a cloud sync directory, also all previews (one container file) would be automatically synced. The easiest way to circumvent this behavior is to create a symbolic link (alias) of your Previews next to the catalog file which points to the actual location of your Previews container (outside the directory used by the Cloud Sync Service) on your hard disk. This way only the symbolic link will be synchronized to your cloud service while the actual preview data remains on your local hard disk. First a quick recap of Smart Previews: Smart Previews are smaller versions (in size and dimensions) of your original photos (in my case mainly DNGs or RAWs) that will be used by Ligthroom in case the original files are not accessible. Lightroom allows you to do modifications and adjustments on Smart Previews the same way as you could do with your original photos. Of course, printing and exporting should only be done while the original photos are accessible. As I do not keep my original photos on a local or directly attached hard disk but rather have them on a network share, Lightroom becomes more or less useless if it cannot access the source files. This is not an issue for the desktop computer as it will always have access to the network drive that contains my photos. For my laptop, which is often used outside my LAN, it is a problem though. The simple solution is to generate Smart Previews on the Lightroom instance installed on my laptop. Currently I have about 50000 photos in my Lightroom catalog and the Smart Previews for these 50k photos add up to roughly 60 GB not too much space by todays hard disk sizes. The location of the Smart Preview container can also not be user defined and like Previews is colocated with the catalog file. So like for Previews, also Smart Previews are not physically located within the Cloud Sync directory but on a different location on my hard disk and only the symbolic link to this container file is being synchronized. The following picture shows my Cloud Sync directory (Users/Marco/CloudStation/Lightroom/) that contains the physical Lightroom catalog (Lightroom Database-5-2.lrcat) and the sybolic links to the physical Previews and Smart Previews container files (Lightroom Database-5-2 Previews.lrdata and Lightroom Database-5-2 Smart Previews.lrdata). The filenames being italicized indicate that these two files are symbolic links (I use a tool called Path Finder instead of the terrible macOS Finder which Apple should be ashamed of!). 2. Make sure you have a backup of your Lightroom catalog! I am using this setup for more than two years now without any real issues - there are a few things you need to be aware of though. You should not open Lightroom on your desktop computer and laptop at the same time. Both Lightroom instances will try to lock the catalog file and you might end up with synchronization conflicts. If it does happen you can easily fix it by closing both Lightroom instances and delete the conflicting file (typically a copy of your Lightroom catalog with a suffix at the filename). The Catalog file will typically be synched every time you close Lightroom and the file lock is released. Once you closed Lightroom on one machine, wait until the Catalog file is synchronized to the second computer before you open Lightroom on the second computer. Be careful if this happens while you are not connected to your LAN as it could take some time to synchronize the Catalog file over the internet. Preview files rendered on one computer will not be synchronized to the other. In case you import photos to Lightroom on your desktop computer, Lightroom will generate Previews. Once you closed Lightroom on your desktop computer and then start Lightroom on your laptop, these Previews will automatically be rendered again on your laptop. This only happens once and should not be too much of an issue.